When geese begin winging their way south, boaters in the far north—places like Chicago, Milwaukee and Duluth—turn to the task of removing their boats from the water and laying them up for the winter. This is the unavoidable consequence of keeping a boat where ice can develop to over three feet thick. However, in more temperate climates where snow and ice are less of an issue, storing a boat in or out of the water becomes an open question. When considering wet versus dry storage, start by penciling out the costs in financial terms. How much does it cost to keep your boat in the water all year long versus six months “in” and six months “out”? In addition to dockage or storage charges, there are other points to consider. Wintering “on the hard” may make financial sense in the long run. This is because fiberglass boats stored on land have a chance to dry out, and for this reason develop fewer osmotic blisters (due to water getting into the fiberglass laminate) compared to boats stored in the water. Blister repairs can be costly, so storing your boat out of the water may be your best choice. Although wet storing your boat might give you an early start on boating in the spring, if your boat’s bottom needs painting, consider dry storage. Many of today’s bottom paints, such as copolymer ablative paints, do not oxidize in air, so you can paint in the fall and be ready to splash in the spring. The bottom line is that if any chance of freeze damage exists, you need to either winterize your boat or implement measures to prevent damage should a freeze occur. 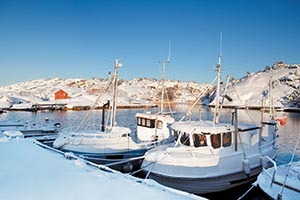 For advice on winter boat storage and how to protect engine, electrical, interior and plumbing systems against winter's chill, visit our Winterizing Headquarters. With the right preparation, you'll save time, money and hassles when you recommission. Rack storage, commonly referred to as dry stacking, has become an increasingly popular way to dry store powerboats during winter layup and/or during the boating season. Originally conceived in the 1950’s as a way to store lightweight powerboats, dry stacking has evolved over the years into a sophisticated industry with facilities able to store boats up to, in the case of one Fort Lauderdale facility, 80 feet long! Rack storage facilities include movable, free-standing racks that can be picked up and moved to various locations within a marina, sheds, which are usually a three-sided building with a roof, and steel dry-stack buildings, often referred to as “barns”. Due to their strength, dry stack “barns” are the best choice for boats stored in hurricane-prone areas. 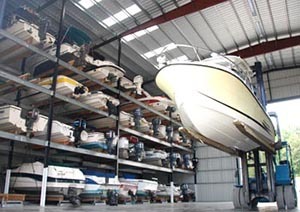 Many rack storage facilities offer a variety of services, such as boat washdowns, along with winterization and shrink wrapping at the end of the year. Make sure you know “up front” what all these things cost. Also, what is their attitude toward do-it-yourselfers? Do they provide an area where you can perform routine maintenance on your boat? 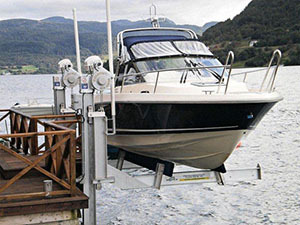 Boat lifts offer you the ability to store your boat high and dry yet ready for use in minutes. However, according to BoatUS, “lifts do not fare well in hurricanes and strong nor’easters. Wind waves and surge, can shift the boat, and torrential rains or heavy snow can increase the boat weight to the point of breaking the lift.” One way to avert these problems is to keep your boat on a trailer—but if you desire to keep your boat on a lift, make sure that the lift is well maintained, of the correct capacity, and that the boat is properly covered to keep rain and snow out. Because boats stored on lifts are surrounded by air, they are (see BoatUS quote above) more vulnerable to a sudden freeze than boats surrounded by water. This means that you will either have to winterize the boat or implement measures, such as a bilge or engine room heater, to avert damage should a freeze occur. Storing your boat on a custom cradle, one specifically designed to support structural areas such as your boat’s engine, bulkheads and keel will help to ensure that the engine remains aligned to the shaft and that the hull does not distort over time. Do not store your boat on a cradle designed for a boat other than yours. The main problem with cradles is that they hog available space in a yard. For this reason, many yards prefer to use adjustable boat stands, also called jack stands, which nest for compact storage when not in use. If you or a yard will be laying up your boat using boat stands, make sure that the hull and keel are properly supported, taking into account load bearing areas within the hull, such as the locations of the boat’s engine, water, fuel and sanitation holding tanks. Emptying your boat’s water and sanitation holding tanks during winterization will help to reduce the load in those areas, but the fuel tank should be 95% full to guard against condensation. Generally speaking, when a boat is blocked and held up by boat stands, the keel should bear most of the weight. 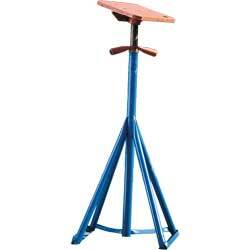 In this case, boat stands serve to balance the boat, not support it. Heavy timbers should support the keel. To get around trial and error shimming, adjustable keel stands can be used. This works well for powerboats and full-keel sailboats, but in the case of sailboats with deep fin keels, sometimes supporting all the weight on the keel puts undue stress on the area where it joins the hull. In these cases, some weight may need to be supported by the stands, taking care not to deform the hull in the process. To prevent failures, best practice dictates that boat stands be chained together to prevent them from spreading apart. Boat stands must be placed at 90° angles to the hull so that the boat’s weight is squarely transferred to the ground. To protect against high winds or hurricanes, it is also smart to anchor a boat on boat stands to the ground. 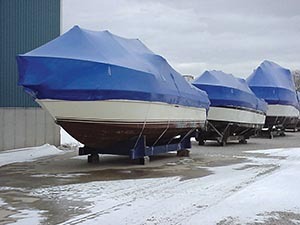 Shrink wrapped boats layed up on cradles. Each installation includes several vents. Shrink wrapping a boat effectively seals out dirt, debris, rain, snow and critters that would like to call your boat home. However, shrink wrap also traps all the moisture inside, which can lead to condensation and mold. The best way to prevent this is to thoroughly dry out your boat before installing the shrink wrap. Adding plenty of vents to the installation will help remaining moisture to escape. Another way to prevent mold is with chlorine dioxide technology, which has been shown in tests to reduce mold spore counts and odors. Star brite offers this technology in their M-D-G Mold/Mildew Odor Control Slow Release Twin Pack, which they claim prevents mold and controls odor for up to three months. Adding a Zippered Access Door to the shrink wrap installation will give you access so you can re-treat the boat midway through the winter. Besides trapping moisture, another downside to shrink wrap is that it can only be installed once and must be disposed of at the beginning of the boating season. The cost of shrink wrapping varies with boat size. For a 20’ boat, first-time do-it-yourselfers can expect to pay $500-$600 which gets them a reusable Heat Gun Kit and enough material for two or three installations. Professionals charge $12-$15 per foot, or around $275 for the same 20' boat. Custom covers are pricy, but they can pay for themselves over time, compared to the yearly cost of shrink wrap. Fabric covers also offer a certain amount of breathability, which can be enhanced by adding vents. In addition, they can be lifted for access to the boat at any time. If you balk at the cost of a custom cover, consider a semi-custom cover such as one of the Trailerite™ series by Taylor Made® Products. We offer these covers and others for a surprisingly large number of boats. If you decide to store your boat under a fabric cover, consider a Boat Cover Support System to prevent the accumulation of rain and snow. For help with selecting a cover for your boat, see Selecting the Right Boat Cover. A simple polyethylene tarp is sometimes the best bet. To prevent the accumulation of rain or snow, you must also support the tarp. Depending on how the boat is configured, one way to do this is to make an A-frame support out of 2 x 4s and a set of saw horse brackets. The A-frame can then be placed inside the boat, the tarp stretched over it, and lashed down tight.